Local Lamb Chops with Red Wine Reduction… a perfect and well-balanced preparation for our Fat Toaster Farm Jacob Sheep lamb chops. With hints of middle eastern spices, this is one of the most beautiful things you’ll ever put in your mouth. Here is how to make it in less than 30 minutes. Mix the garlic powder, thyme, cardamom, and cinnamon in a mortar and use pestle to mix up the ingredients and crush the thyme. Lay chops out on a flat surface and place 1/2 of the salt across the surface of one side of the chops. Liberally sprinkle the spice mixture across the surface of the chops. Turn the chops over and season the other side with the other 1/2 of the salt and a coating of the spices. On the stovetop place a cast iron or other oven-safe 10″ (or larger) saute/frying pan over high heat. When the pan is very hot, put the canola oil in the pan and immediately add the seasoned chops. Sear for 2 minutes on one side, turn the chops, and then place in the preheated oven. Bake for 6 minutes for medium rare (recommended). Remove pan from oven and immediately move chops to a single layer on a plate. Cover with foil for 5-8 minutes to rest. 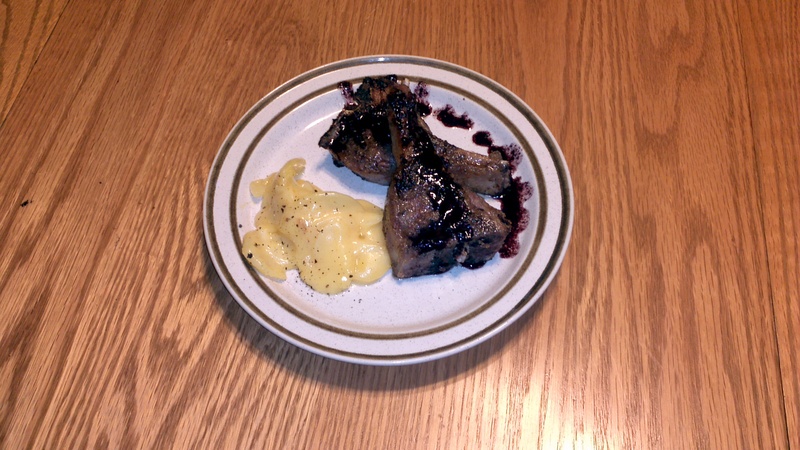 While the chops are resting you will make your wine reduction sauce. Heat the pan over medium-high heat and add the wine. Use a spoon or whisk to scrape the bits in the bottom of the pan as the wine reduces. When the wine is reduced by at least 1/2, turn off the heat and whisk-in the butter until incorporated. Arrange 2-3 chops per serving and spoon the wine reduction over each chop. Freshly cracked pepper over the top and you have completed this amazing dish. Wonderful when served with creamy au gratin potatoes or your favorite vegetable.